The I.T. 3100 is an industrial grade time recorder. 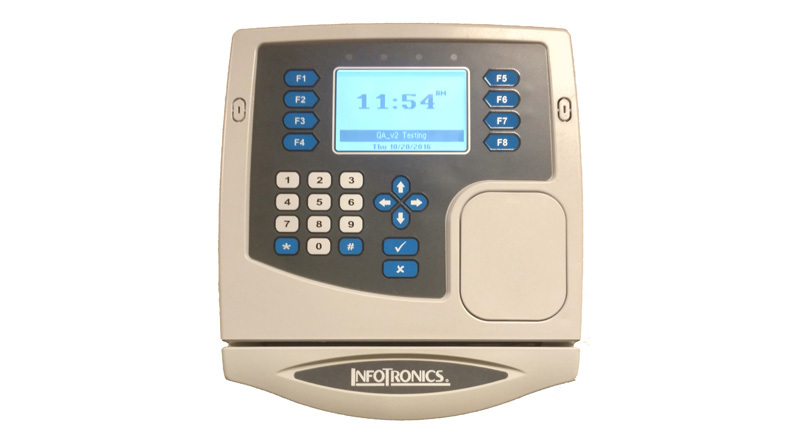 It provides ATM-style function keys, multiple reader options, and can operate in any kind of industrial environments. Employees punch In and Out and perform many comprehensive functions using a badge, PIN entry or finger. The I.T. 3100 has a capacity of approximately 1000 employees. Additionally, the I.T. 3100 stores 5000 transactions, 3000 schedules and 7000 workgroups. The I.T. 3100 has Internet capability and is easy to install. This time clock is easy to use, and requires very little training. Multiple reader modules. Barcode swipe card reader, magnetic swipe card reader, proximity card reader, and biometric reader are supported. Optional modules. The I.T. 3100 supports backup battery, Power over Ethernet (PoE) and bell ringing. Comprehensive function key operations. Eight ATM-style function keys can be used for employees and supervisors. Employees can review worked hours, check benefits, enter tips, and so on. Supervisors can perform transactions on behalf of employees. Employee punch restrictions. This feature prevents employees from punching In or Out at unauthorized times. Please contact Tech Support @ 423.267.6611 before connecting!